For heritage garden lovers, roses surely top the list for summer wow factor. This beautifully versa-tile historical plant is an absolute must for the traditional English garden look, whether for a busy, brimming cottage garden or a finer, more formal garden design. Take a tour of the rose garden with us…Shrub roses in all sizes create interest in borders and pots at ground level, climbing roses adorn walls and fences and rambling roses romp up onto low rooftops and twine trough trees. In gardens’ open spaces and at entrances there are opportunities for freestanding height and structural impact with the introduction of complementing garden arches, obelisks, gazebos and arbours. Homing in on one of these framework elements, the installation of a metal rose arch can be such a simple fix for striking, instant structure. Let’s explore some options, including which roses might suit a well-made designer arch and how to plant them up. For an assault on the senses and barrow-loads of real-life rose garden inspiration, head for a re-nowned, iconic example in the summertime. Some of the National Trust gardens are just the ticket. We love Tyntesfield, one of our closest National Trust places. Majoring on magnificent rose displays, Mottisfont in Hampshire and Sissinghurst in Kent, where Vita Sackville-West would often find herself ‘drunk on roses’, are magical too. So, to the arch itself. The last thing we want is for a painstakingly tended, mature, arched rose to be cut short because the arch itself rusts or rots and collapses. Garden Requisites’ zinc-galvanised metal garden arches are made ‘for life’. They are frost-proof and weather proof, standing strong with 15” integral long legs to push or concrete into the ground. Simple Roman and Gothic arch shapes can stand alone or come with matching side panels as well as linking to matching trellis fencing, with or without built-in gates if needed. In addition to their long-lasting nature, our arches are aesthetically attractive too. The lattice wirework itself is carefully hand crafted using skills more akin to the textiles industry. Nimble fin-gers deftly weave the crimped lengths of wire that can be aged for pleasing tactile results. 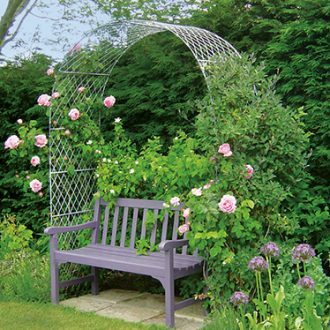 Lattice wirework is also ideal for climbing roses as they don’t twine or cling, so branches and shoots won’t fall down through gaps. On to the plants. Roses can be planted at any time of year in the British garden except for mid-winter when the ground may be frozen. At time of writing (June), container-grown climbing roses from a reputable local garden centre are the best bet as they will have had a head start and should put on good further growth in the warm soil and weather. In Autumn, we recommend ordering bare root roses, easier on the pocket and sometimes better plants. Check that any container-grown plants are very healthy with no black spot. For colour and impact inspiration, scoot on over to our Rose Garden Arches Pinterest board. Choose your arch rose carefully. Some climbing and rambling roses will overwhelm an arch. Here’s good guidance – Roses ideal for a Rose arch. If we are to name any, our personal favourite climbing roses for metal trellis arches have to be David Austin’s pink showstopper ‘Gertrude Jekyll’ and repeat-flowering, claret red Tess of the D’Urbervilles. There are so many – not an unpleasant problem to have though! If you’ve fallen for a single-flowering rose, it could also be worth selecting a clematis as a partner to extend the flowering fireworks. Whether your arch rose is Old Garden (Bourbon, Alba, Damask, Tea), or Modern (Hybrid Tea or Floribunda), planting with some well-rotted garden compost or manure will get the plant off to a flying start and, with regular watering, a bit of feeding and a bit of pruning at the right time, your arch rose will thrive and deliver bountiful, beautiful blooms for many years to come. Now, where’s that rose catalogue?